Welcome To South Warwickshire Electrical Services Ltd. Installation, maintenance and electrical design are some of the range of services that we provide for our customers. We specialise in full property rewiring, installation, testing and inspection. No project is too large or too small for our certified electricians, give us a call to see how we can help you on 01926 424 000. We cater for domestic, commercial and industrial clients who are located in Warwick, Leamington Spa, Kenilworth, Southam, Coventry, Stratford upon Avon, Rugby and the surrounding areas of Warwickshire and the West Midlands. Call us today on 01926 424 000 and we can tell you if we can be of service. We welcome your enquiry and we are happy to undertake all local electrical work from small installations to large projects. We supply and install all kinds of electrical services from large power/lighting installations to small electrical fitting, re-lamping, etc. New factory or warehouse designs and installations, also installation of 3-Phase cables and outlets. Our electrical work for our clients is carried out to the highest possible standard. Our professional engineers have been in the industry for over 30 years and are all experienced Part P qualified. We are registered members both with NAPIT (the National Association of Professional Inspectors and Testers), and the Trustmark organisation, supported by the government for trustworthy tradesman. For extra piece of mind the installation service that we provide is fully backed up by our own personal guarantee and NAPIT backed insurance. With 20 years experience we specialise in all aspects of electrical installation testing! 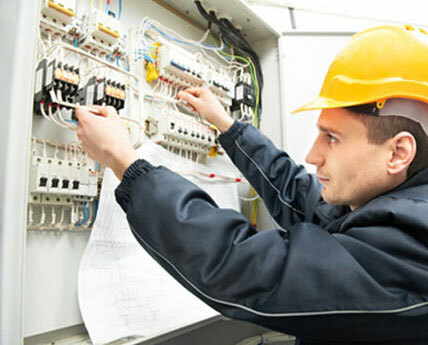 We are electricians based locally in Leamington Spa with the ethos that we must dedicate our service to being punctual, quality driven, superior customer service and competitively priced, which in turn make us your first choice for all electrical work that you will require. We are based in the Warwick and Leamington Spa area and our services include electrical testing, rewiring, maintenance, electrical alterations, lighting design and control. We take on large or small projects. No job is too small for us - from fitting a socket, light fitting or to a complete house, office or factory re-wire. Give us a call today on 01926 424 000 or 07973 642698 / 07967 294093 for a free no obligation quotation.